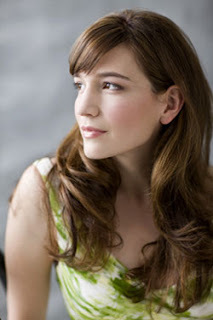 Last season, mezzo-soprano Kate Lindsey took on the title role in Seattle Opera's world premiere of Amelia, but this time around, she explores more familiar territory as Rosina in the Friday/Sunday cast of The Barber of Seville. We talked to Lindsey this week and asked her about returning to Seattle, the difference in prepping for a world premiere versus a classic role, and what Rosina really thinks about the men in her life. Audiences here will undoubtedly remember you from Amelia. When it comes to how you prepare for a role, what are the differences between a new work like that and prepping for a such a well-known character like Rosina in Barber? Well, I have sung Rosina several times before this, so it was a very different experience to walk into Barber vs. Amelia. With Amelia, I began learning the music a little over a year before the start of rehearsals because I wanted to have the music completely in my body in order to feel fully comfortable with the music on Day One of rehearsals. In regard to Barber, I've performed Rosina in several different productions over the past 5 years, which naturally helped me to feel much more relaxed in preparing to walk into rehearsals in December. My main objective with Barber was to walk in with an open mind and blank slate so that we could all really enjoy being creative together—even though we've all performed it a few times before! 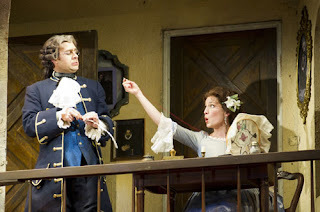 Patrick Carfizzi (Dr. Bartolo) and Kate Lindsey (Rosina) in The Barber of Seville. You’ve performed Barber with Dean Williamson before, is that correct? Yes, I did my first and second Rosinas with Dean back in 2006 at Washington East Opera and Opera Theatre of St. Louis. I'm still using the musical ornamentation he helped me develop for the role! This time around, I think we are much more relaxed. We've both lived with this rep for quite some time now, and I find it to be a true comfort to look into the pit and see Dean smiling up at me. We have a great time working together. All the productions of Barber that we've done together have been very different—but fun every time! Let’s talk about your character a bit. Rosina and Figaro have some wonderful interactions in Barber and I wonder: What does Rosina really think about him? What do you think their relationship is like when we zoom out beyond this one day? I think Rosina and Figaro are great friends - they are so close that they even enjoy pushing each other's buttons from time to time! Figaro is truly the only person Rosina can trust, and he's her only link to the outside world, so I think she holds that relationship very close to her heart. This might be why you see Figaro still with "the family" in Le nozze di Figaro! Figaro cares about Rosina in a protective way, and she's lucky to have him, especially in Bartolo's crazy household. 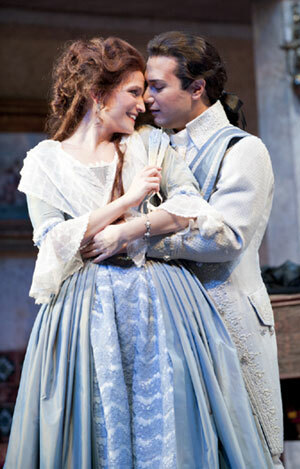 Kate Lindsey (Rosina) and Nicholas Phan (Count Almaviva) in the The Barber of Seville. I think a very interesting moment in the opera is when Rosina finds out who the Count really is. What do you think it’s like for her at that moment, knowing her entire life is about to change? Hah—I think the first thing this fiery girl realizes is that she's been completely duped! She thought she had this whole thing figured out, and then she realizes that she never knew what in the world was going on. Once she gets over that initial shock, I think she feels shy because, all of a sudden, she's not really sure that she actually knows this person who's been serenading her all this time. Then, there's the classic "Whoa, this guy is way out of my league" moment in which the Count has to assure her that he loves her for her alone, just the way she is. I don't think she even realizes in that moment how much her life is going to change as a result of learning his identity. I just think she feels joy and relief that she doesn't have to marry Bartolo after all! This is your second time in Seattle. How comfortable are you with the city by now? What sort of things do you do around town in your free time? I've gotten very comfortable in Seattle, especially since I've been here quite a bit over the past months due to the fact that when I was performing in Amelia, I started dating someone who lives here! Needless to say, I'm liking Seattle more and more each day. Life feels pretty incredible when you're able to pursue the passion of your work while also being able to share time with the one you love. To most people, that's a very normal thing, but for me it's pure novelty! Seattle has got great food, and we've definitely been enjoying our fair share of that over the past months. I've also just enjoyed getting to know various neighborhoods. Each one has a very distinct personality, and I can really appreciate that.